The HELIOS WATCH city plus is calculated and manufactured for your unique location. Sundial watch with display of any standard summertime (daylight saving time), e. g. Central European Summertime (CEST). Calculated and manufactured for your unique location. You can also request standard time (e.g. CET) or solar time (LAT) for your location. The sundial wristwatch HELIOS WATCH is one of our most popular sundials. Reason enough to put a larger version with 48mm diameter aside. The HELIOSWATCH City plus has a polished lost-wax casting case made of rhodium-coated brass and a skin-friendly plastic base. 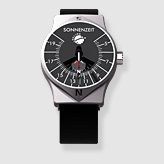 A built-in compass from German production with liquid-damped, sapphire-bearing, red needle ensures the rapid arrangement of the sundial. The stainless steel gnomon is retractable and casts a clear shadow on the laser-printed dial made of bright anodized aluminum. It is calculated as a "city version" for your desired location (latitude 35°N to 58°N). If you do not give us any other information, we will determine the coordinates from your address data and calculate the sundial for the standard summertime (daylight saving time) of your country. For central Europe it is the Central European Summertime (CEST). Alternatives are the standard time (e. g. CET) or the solar time (LAT) if desired.